Philadelphia-native composer, arranger and pianist John di Martino is a versatile musician who is equally comfortable in the straight ahead jazz, Latin jazz and world music scenes. 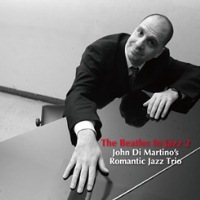 di Martino has released more than seven well-received leader albums from the Japanese Venus Records, with different rhythm sections, under the moniker "Romantic Jazz Trio." This latest release is a second in a series of fascinating projects: The Beatles In Jazz. While many jazz musicians have recorded Lennon/McCartney songs in various styles of jazz, it is still rare to see an entire album of this concept, especially by a piano trio. Following the success of the first installment, di Martino tackled a collectino of lesser-known (relatively speaking) tunes by the Fabulous Four. di Martino tastefully expands the harmonic structures of these well-known melodies to add depths while respecting the melodic integrity. His choices of tempi and rhythmic treatments are varied and effective. Bassist Boris Kozlov and drummer Alvin Atkinson provide sensitive and sensual support. The vivid and powerful sound is also a plus. You'll be amazed at how these familiar melodies are transformed into intelligent, ellegant and soulful jazz! The first album, The Beatles in Jazz (VHCD-1037) is available here. Recorded at Tedesco Studio in New York on October 8 & 9, 2011. Engineered by Jon Rosenberg. Mixed and Mastered by Venus Hyper Magnum Sound: Tetsuo Hara.